Again, to find the magnetic field pattern around a wire, we can sprinkle iron filings around the wire or use a plotting compass as discussed in Magnetism with the setup as shown below. The following magnetic field pattern will be observed for different direction of current flow through the wire. 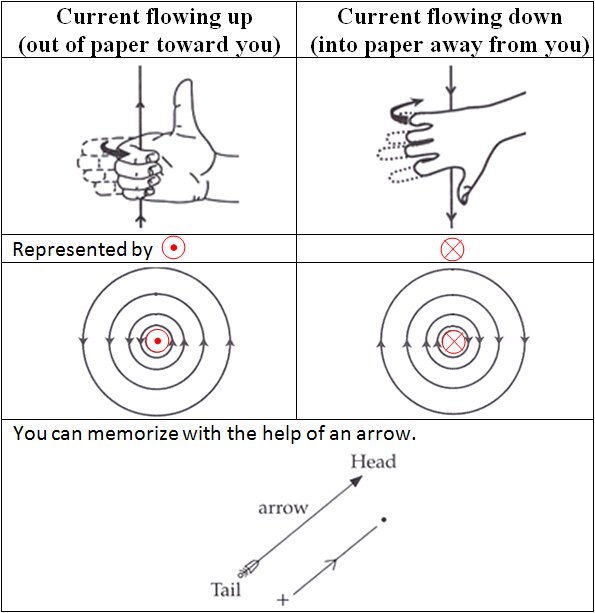 The direction of magnetic field is determined by Right Hand Grip Rule. Note that the stronger the current flowing, the stronger the magnetic field strength produced. Flowing current in each wire produces its own magnetic field lines and interact with those produced by another wire, which resulting in a combined magnetic field lines. Magnetic field strength decreases with increasing distance from the wire. 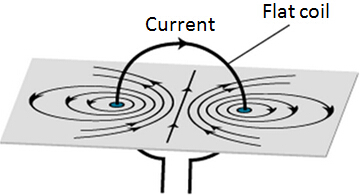 Like current means the current in the wires flow in the ﻿same direction﻿. Likewise for ﻿unlike current ﻿where current in the wires flow in the ﻿opposite direction﻿. It is same as the field pattern for unlike current. Solenoid is several hundred turns on a coil. By combining each field pattern formed by a flat coil, we will get a field pattern around a solenoid as shown below. Its pattern is quite similar to that of a bar magnet. Thus, we can say that it acts like an ﻿electromagnet﻿ with two poles. The polarity of solenoid can be determined by Right Hand Grip Rule. However, unlike magnet, there are no field lines coming out from the side of solenoid. Insert a soft iron core into the solenoid. The magnetic field is stronger inside the solenoid. The magnetic field lines are parallel inside the solenoid, which means the magnetic field strength is uniform inside the solenoid.